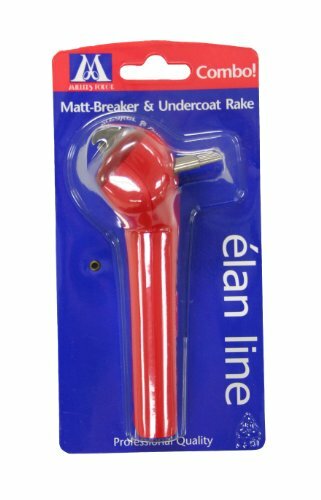 The Elan Matt Breaker & Undercoat Rake is a two in one tool. The undercoat rake removes dead and loose hair. The matt breaker safely cuts out tangled hair. This combination tool is great for medium and long-haired dogs. The entire Elan line of grooming tools were designed to be lightweight and easy to use. This helps reduce Carpal Tunnel Syndrome issues that were the number one compliant from groomers in the Miller's Forge survey conducted in 2011. The entire Elan line of grooming tools include a "no tick" symbol on the handle of some tools. This shows that those products help get rid of ticks and/or keep them at bay.